Did you know that roughly one in four women faces pelvic floor disorders? Problems such as incontinence of the bladder and bowel and organ prolapse (descent of the pelvic organs, pressure or bulge), overactive bladder, and emptying disorders occur in women—of all ages. Causes may include disease, hormonal changes, pregnancy and childbirth, high-impact sports, injury and aging, as well as obesity. Dr. Megan Shannon, a urogynecologist at Virginia Women’s Center, is passionate about helping women understand their bodies, and takes time to explain their pelvic anatomy and how the pelvic floor muscles can affect their bladder and bowel symptoms. She recognizes many women are hesitant to talk about pelvic pain, bladder, bowel or prolapse issues and she wants to change that. 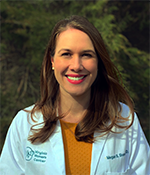 Megan B. Shannon, MD joined Virginia Women’s Center in 2018 and practices at our Short Pump, Mechanicsville and Midlothian locations. As a Urogynecologist, Dr. Shannon has been specialty trained in medical and surgical options for women with pelvic floor disorders.